Houston, Dec. 8, 2017 - The University of Houston has received the 2017 Food Recovery Challenge national award thanks in large part to two food recovery programs: the student-driven Food Recovery Network at UH and The Campus Kitchen at UH. "Food Recovery Challenge award winners serve as role models in their communities and for other organizations," said EPA Administrator Scott Pruitt in a news release. "Their hard work and effective efforts to divert wasted food from landfills is paying off through social, financial and environmental benefits. I encourage other organizations to replicate the successful food recovery operations of our Challenge winners." In 2016, more than 950 businesses, governments and organizations participated in the EPA's Food Recovery Challenge. 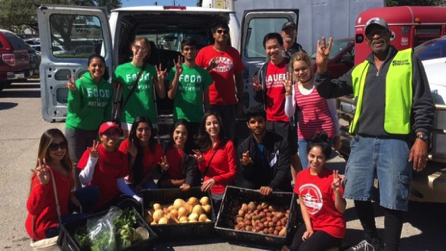 Thanks in large part to the Food Recovery Network at UH and The Campus Kitchen at UH, which work to recover food from dining commons and retail locations on campus, the University donated 39,763 pounds of food in 2016 to food pantries and kitchens in the surrounding neighborhood. It also composted 71 pounds of food waste for use in the Campus Community Garden. For its contribution, the University was awarded the Data-driven Improvement Food Recovery Challenge national award in the Colleges and Universities category. Other participants in the Food Recovery Challenge included grocers, restaurants, educational institutions and sports and entertainment venues across the country. Altogether, the organizations diverted 740,000 tons of food from being sent to landfills or incinerated, saving businesses up to $37 million in avoided waste disposal fees. For more information about the Food Recovery Network at UH, visit the organization's Facebook page. For more information about The Campus Kitchen at UH, go to its Facebook page. Click here to view the EPA news release announcing the 2017 Food Recovery Challenge award winners. The University of Houston is a Carnegie-designated Tier One public research university recognized by The Princeton Review as one of the nation's best colleges for undergraduate education. UH serves the globally competitive Houston and Gulf Coast Region by providing world-class faculty, experiential learning and strategic industry partnerships. Located in the nation's fourth-largest city, UH serves nearly 45,300 students in the most ethnically and culturally diverse region in the country.